The military doesn’t “give” us the right to protest. The Constitution does. 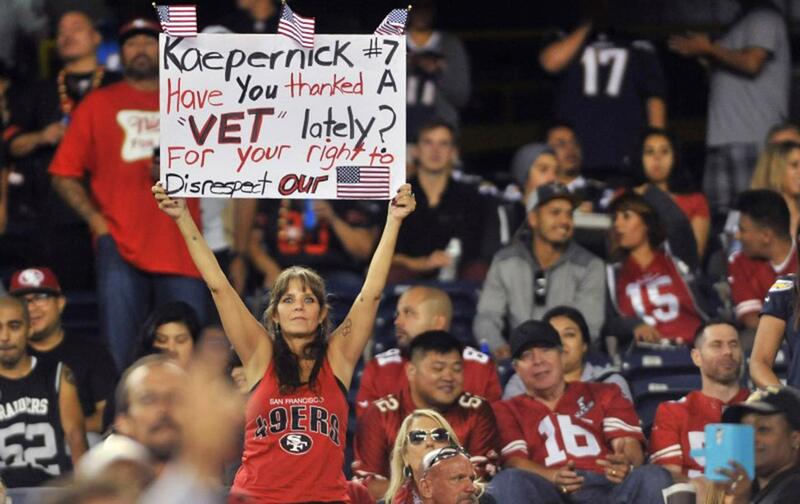 His effort to shine a light on our broken system was met with boos from the San Diego crowd at a game that had been long advertised as “military appreciation night.” The fans registered their disapproval, despite the fact that Kaepernick’s protest has nothing to do with the military. And yet despite all of this, Kaepernick’s protest continues to be framed by too many as an affront to the armed forces. Maybe that’s because so many soldiers in the military of 1968 were “anti-military” themselves. Thousands of US soldiers were coming home from Vietnam in coffins. Military members were writing for underground anti-war newspapers, fragging their own officers, and becoming sympathetic with the national liberation struggle of the North Vietnamese (read Soldiers in Revolt by David Cortright for a great accounting of this time). But I think that’s only part of the reason Carlos and Smith were spared this line of attack. This country—despite its awful treatment of soldiers when they return home—worships the cult of the military. And professional sports—especially the NFL—have played a central role. In addition to the military flyovers, the generals flipping coins at the start of the Super Bowl and the staged “reunions” at NFL games, the US Department of Defense paid $5.4 million from 2011 to 2014 to 14 NFL teams to stage “Salute the Troops” events. These involved product placement, advertising, and “casual” (also known as “subliminal”) mentions. And now we have arrived at a frightening point where an act of dissent that has nothing to do with the military is labeled disrespectful to men and women in uniform. The message is that Kaepernick has this “freedom” to protest only because of the protections accorded us by our military. This is such a disturbing—and a very post-9/11—concept. If we accept the notion that we are allowed to raise our voices, or take a knee in dissent, only by the good graces of the military, then we are also implicitly saying that the military has the right to take that ability away. And that’s the thing about the right to dissent: You use it or lose it. So again, for the cheap seats: Colin Kaepernick is trying to raise awareness about police violence. If you believe he only has the right to do that because of the US military, you are arguing that dissent is possible only if the people with the guns approve.